We went to buy some cat food for Ollie at the vet's last week, and then we saw a picture of the cutest little kittens with the text: "ADOPT ME". We looked at each other... came home.... picked up the phone and went to look at the kittens. Of course we were sold immediately! There were 5 boys and a girl, and we both fell in love with the only (male) tabby. The poor kittens were left at a garbage heap and on top of that were abandoned by their mother. Fortunately they were rescued by PAWS, and brought up by a pleasant lady. As of now they are only 5 - 7 weeks old. Too young to leave the mother, but they don't have one... so Mickey came home with us. We live in a "cat house" anyway; there are already three cats in the house, Ollie (17), Rosie (6) and Mouse (almost 2). Ollie has traveled the world, he was rescued in Bermuda by Murray. 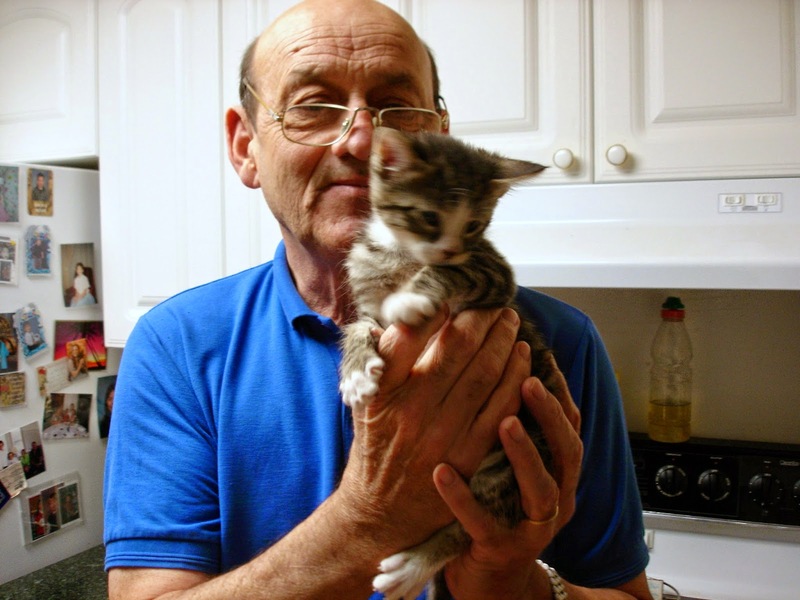 He was a kitten of a feral cat, and when a tornado was coming Murray captured both him and his Mom. When Murray lived in England, he adopted Rosie. She was abused as a kitten and still has the scars where she underwent severe surgery. Mouse, the youngest, just walked into his life. I still lived in Holland, and Murray stopped near the highway to take a few pictures of the mountains. He was greeted by a cute black and white kitten, and the owner just begged him to take it with him. Murray didn't need to be told twice, it would only be a matter of time before the cat would be killed by the high speed traffic. And now we have another rescue kitten in the house... sweet little Mickey. Soon I will write something about his first day with us and publish the video, but first we need to sign the adoption form and spend some time with him!